Wheatfield Souldiers celebrate following the team's 5-0 victory over the Humiliation in the 2014 UUHA Championship Final. Kelly McCaig (#8) had 4 points (2 goals, 2 assists) in the game. TORONTO - The Wheatfield Souldiers have won the 2014 UUHA title, defeating the Humiliation 5-0 in the Championship Final. Meanwhile, the Jokers outscored the Parkdale Lads 6-3 to claim victory in the Bronze Medal game, while the Brockton Rockets won the Consolation Final by bettering the Parkdale Porcupines 5-2. 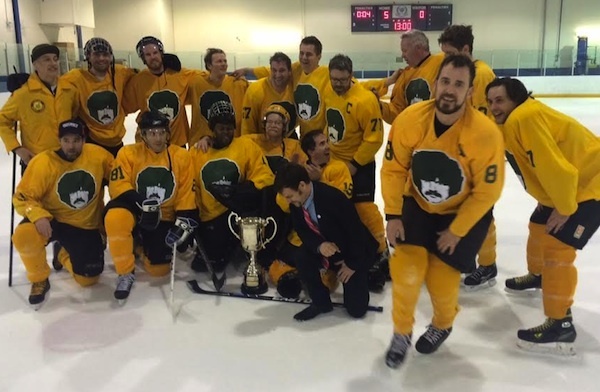 The win represented the Souldiers third UUHA title, having previously claimed the Cup in 2012 and 2010. The Souldiers and Humiliation previously met in the Finals in 2012, where the former defeated the latter by a score of 3-0. That the two teams even made it to the Championship Final this season surprised many, as neither squad could've reasonably been labeled a playoff favourite mere weeks ago. For their part, the Souldiers managed to salvage a .500 record with a pair of late Regular Season wins. The Humiliation, meanwhile, occupied last place in the league standings for much of the Regular Season after enduring the slowest start in the franchise's storied history. Though still in search of their first UUHA title, the Humiliation now have the commendable distinction of having made consecutive appearances in the last three Finals. The Humiliation knocked both the Parkdale Hockey Lads and the Parkdale Porcupines out of contention en route to this year's big game. The Souldiers, meanwhile, dispatched the Brockton Rockets and then the Beau's Beer Hack on their march to the Cup. Kelly McCaig opened the scoring early in the contest, taking a feed from Derek Domingos to the net and solving goaltender Luke Smit hard along the ice just over two minutes into the 1st period. McCaig then set up linemate Ryan Turner about four minutes later to bolster the Souldiers' lead to 2-0. Then, with just 26 seconds remaining in the period, winger Jon Weier poked a fortuitous goal-mouth rebound in to put his side up by three. McCaig was credited with the assist on that tally, as well. After a scoreless 2nd period, veteran Souldiers winger Wes Gerbrandt would intercept an errant clearing attempt mere feet in front of the Humiliation net and successfully snipe the puck high corner glove side increasing his side's lead to 4-0. Two-and-a-half minutes later Keven Magura would circle the Humiliation net off the faceoff and get the puck back to centreman McCaig who took it to the net and went hard, short side for his second goal of the contest. That tally was among the last of 28 shots credited to the Souldiers, while the Humiliation unsuccessfully tested goaltender Sheldon Shurland on just seven occasions over the course of the game. The Bronze Medal Game saw the Jokers and Parkdale Lads tied 1-1 after the opening frame on goals by Jokers captain Ted Bisaillion and Lads rookie Ian Seaton. Come the 2nd period most of the Jokers bench had clued into the fact their formerly Los Angeles-based teammate Marc Hickox hadn't merely failed to show up and dress for his team but was, in fact, clandestinely playing goal for the opposition. Perhaps inspired by the hilarious antics, Jokers Mike Takacs and Gary Rideout Jr. managed to solve Hickox three consecutive times (Takacs potted a pair) before Lads forward Mike Frolick staunched the bleeding with his first goal of the playoffs at the 1:07 mark, making it 4-2 in the Jokers' favour. But 3rd period goals by Jokers veterans Charlie Rishor and Adrian Cavan rendered the lead insurmountable despite best efforts from Seaton who solved goaltender Burke Lawrence once more with just 25 seconds left on the clock. Immediately after the game Lads (and league) scoring leader Kyle Welton was presented with the UUHA MVP Belt, designed and made by timekeeper and official league photographer Mike Ivall. The Lads were also presented with the UUHA Director's Cup which, like the NHL's President's Cup, is (now) awarded annually to the team that finishes the Regular Season with the most points. The Lads went 9-4-3 over the course of the Regular Season which was good for 23.5 points and best-ever finish in the team's long history. Meanwhile, the Consolation Final saw the Brockton Rockets earn bragging rights with a 5-2 win over the Parkdale Porcupines. Oliver Sutherns and Ian St. Aubin both netted a pair of goals for the winning side (Joseph Desjardins was credited with a late empty-net tally), while Adam Thrasher and Elia Vastis combined for the Porcs tallies. Despite the score, the Rockets narrowly edged the Pines in shots with 23 to 19 attempts.